FCEF ceo, Nesbitt Hazelman during the ‘talanoa’ session with Ministry of Employment Productivity and Industrial Relation at Tanoa Plaza on January 30, 2019. The ‘talanoa’ session between the Fiji Commerce and Employers Federation and the Ministry of Employment, Productivity and Industrial Relations was a fruitful one. FCEF Chief Executive Officer, Nesbitt Hazelman told SunBiz they had invited the Ministry to address members. The meeting was held at Tanoa Plaza, Suva yesterday. The new legislation is the ER (Budget Amendment) Act 2018 that came into effect from 01 January 2019. Mr Hazelmen said: “This is logic to do with the leave where a lot of grey areas that were around those provisions. “Some of the employers have problem with that. “We have also seen in the newspapers some of the comments by employers. He said there were 150 private sector organisations and the meeting was very well attended and a fruitful one. The meeting also touched on workers and accident compensation act and how are to be handle and moving forward. There were a lot of questions from the members on how it’s going to be applied, what employers can do. And where does the liability lie. Does it lie with employer or with the new commission? Mr Hazelmen said all of these issues were clarified. The employers were able to have a better understanding of what needs to be done. 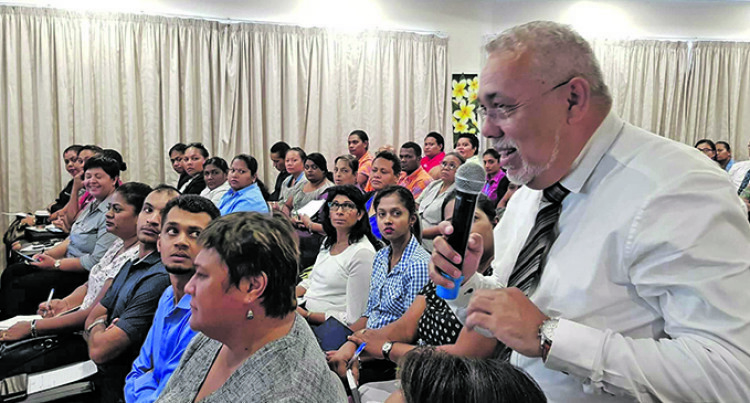 Assistant Minister to the Minister for Employment, Productivity and Industrial Relations, Alvick Maharaj said “as employers you play an important role in providing employment and improving the livelihood of workers in Fiji. Mr Maharaj said the Government has been actively promoting social dialogue throughout its labour reform phases and they will continue to promote this in our journey ahead. “Through this, Government has ratified Convention No.144 on Tripartite consultation and this is fulfilled through representatives of employers and workers in the three main Boards of the Ministry namely the Employment Relations 3 Advisory Board (ERAB), the National Occupational Health and Safety Advisory Board (NOHSAB) and the National Employment Centre Board (NECB). Recently, Mr Maharaj said the Ministry has been receiving enquiries from employers on the new leave provisions and your request for interpretation and simplification on these new changes is a timely one. Director Labour Standards Services, Atish Kumar and the Senior Labour Officer, Workers Compensation, Shabana Khan enlightened the members on the changes in our labour laws.